Model WB-953 is a high performance wheel balancer that is self-calibrating, and has self-diagnosis. This balancer can be used on both automotive and motorcycle wheels. 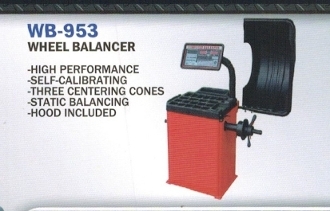 To balance automotive tires you just need the WB-953 balancer as shown; to balance motorcycle wheels just add the two motorcycle wheel adapter kits. •Model WB-953 is a high performance wheel balancer that is used for automotive wheels in standard form, and balances motorcycle wheels using the two available adapter kits. •This is an affordable good quality imported model that is affordable enough for the individual to give you equipment just like a professional repair or race shop. •Maximum wheel weight is 150 lbs. Shipping wt. is 335 lbs.